Chanukah gifts, gift wrapping, balloons, costumes from Etoile. Custom gift wrapping, gifts, paper goods, decorations and costumes for Chanukah, the Festival of Lights. Chanukah begins on the 25th day of the Hebrew month of Kislev, but the starting date on the western calendar varies from year to year. The holiday celebrates the events which took place over 2,300 years ago in the land of Judea, which is now Israel. Long ago in the land of Judea there was a Syrian king, Antiochus. The king ordered the Jewish people to reject their God, their religion, their customs and their beliefs and to worship the Greek gods. There were some who did as they were told, but many refused. One who refused was Judah Maccabee. Judah and his four brothers formed an army and chose as their name the word “Maccabee”, which means hammer. After three years of fighting, the Maccabees were finally successful in driving the Syrians out of Israel and reclaimed the Temple in Jerusalem. The Maccabees wanted to clean the building and to remove the hated Greek symbols and statues. On the 25th day of the month of Kislev, the job was finished and the temple was rededicated. When Judah and his followers finished cleaning the temple, they wanted to light the eternal light, known as the N’er Tamid, which is present in every Jewish house of worship. Once lit, the oil lamp should never be extinguished. Only a tiny jug of oil was found with only enough for a single day. The oil lamp was filled and lit. Then a miracle occurred as the tiny amount of oil stayed lit not for one day, but for eight days. Jews celebrate Chanukah to mark the victory over the Syrians and the rededication of the Jerusalem Temple. 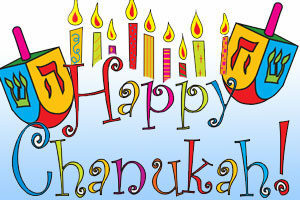 The Festival of the Lights, Chanukah, lasts for eight days to commemorate the miracle of the oil. The word Chanukah means “rededication”.